Disclaimer: I’m a pretty liberal person, I’m against racism, I do not believe that the best America is an all white one and I would quite literally set myself on fire before writing “Trump” on my ballot in November. However, I am reporting these events as they happened and in the most accurate way I can. 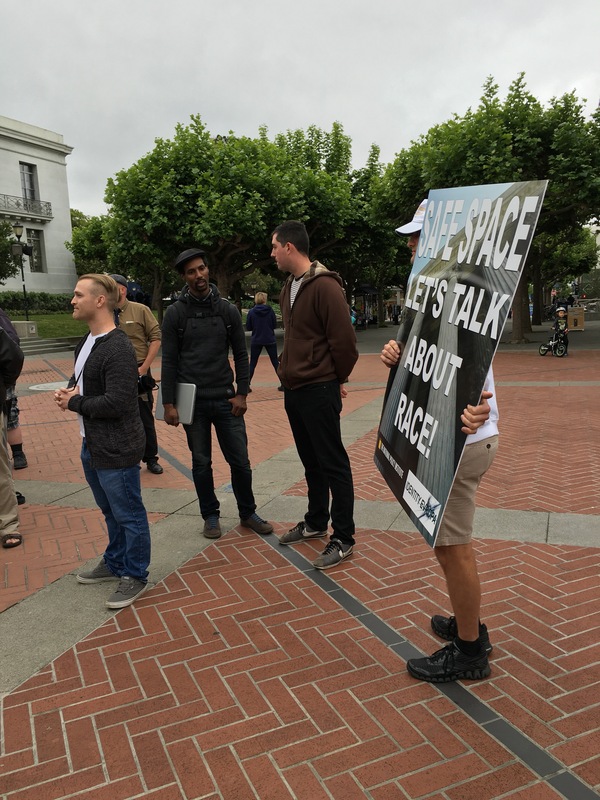 This is what happened on Sproul Plaza at UC Berkeley yesterday. I was initially on the look out for a Trump rally on campus. 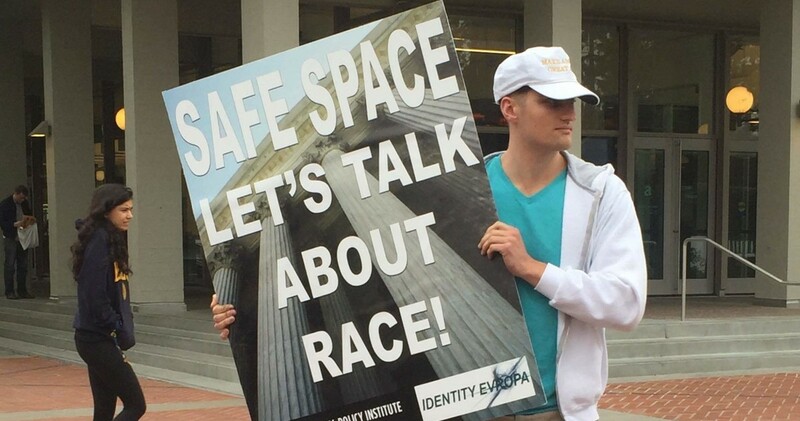 Instead, I found advocates of “European Identity” and white nationalism from “Identity Evropa,” a group promoting these ideas. They don’t like the phrase “white supremacists” although there are those, myself and the Southern Poverty Law Center included, that would argue that’s the only accurate description. 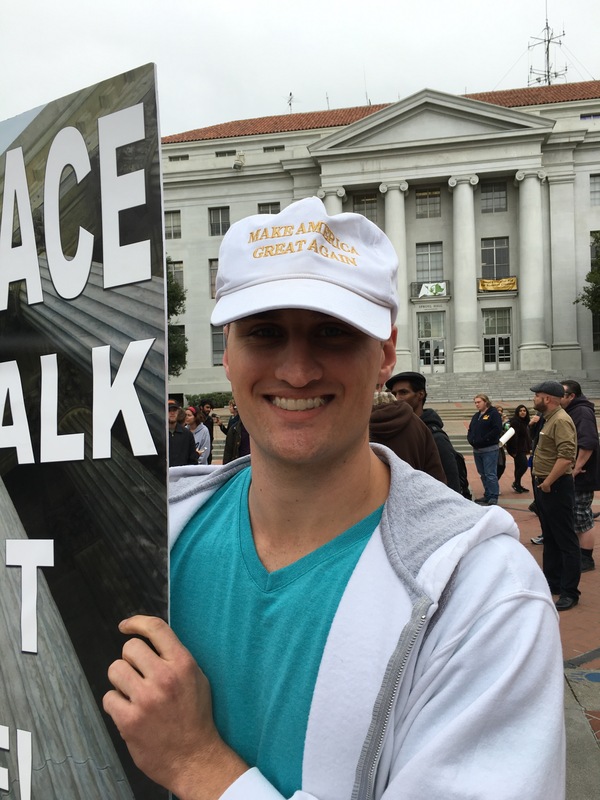 The Trump supporters were not what I expected. These people were articulate and while most refused to give me their credentials, seemed more or less educated, teeth intact. I spoke with the man who appeared to be the leader, the one everyone naturally gathered around, Richard Spencer, for about 40 minutes. I didn’t learn this until after the interview was over but Spencer is the President of the National Policy Institute in DC, a white nationalist think tank. The entire time he was civil, articulate, witty and charming. I see why people follow him. He just sounds like he knows what he’s talking about, in a really dangerous way. Let me paint this picture. 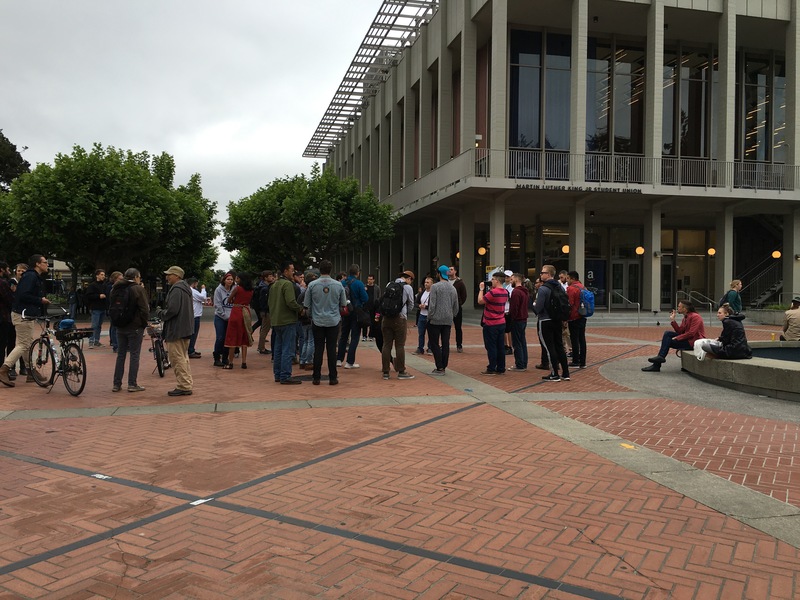 It’s an overcast, cold and rainy day in Berkeley on Sproul Plaza. We are steps away from where Mario Savio championed putting “your bodies upon the gears and upon the wheels” of the machine. I start interviewing Spencer after talking to a few of his friends and/or colleagues that seem more like dedicated lackeys than anything else. His authority was never made explicit to me but it was palpable, whether or not formally in charge, this man was the one they followed. As I start talking to him, his friend/supporter/cameraman, whose name I did not catch, videotaped the first few minutes of our conversation for a program called “Red Ice” that I later learned describes itself as “covering politics and social issues from a pro-European perspective.” The podcast version of their show has been censored on iTunes and is not recognized in podcast listings through Windows. It started like most interviews, we spelled our names, etc. I asked him what ethnicity and gender he identifies as. He laughs at the idea of identifying as one of these and says “I’m a man” as if it is so unquestionably obvious, like ‘Can’t you sense my manliness?’ The lackeys laugh too – someone just asked their alpha male if he was male at all. By now, they have assembled. About 20 men from his group have gathered in a circle around us, just he and I in the center of this storm’s eye of a white supremacist hurricane. For a moment, I am very conscious of being a tiny 5 foot woman surrounded by 20 men at least a foot taller than me while I challenge their alpha. I pause, but persist, I won’t be deterred by some tall people standing near me. To the ethnicity he says he’s European, more specifically German and English. Then he inserts a sarcastic, “I identify as a black lesbian” and the lackeys roar with laughter. The camera guy asks if this offends me, I tell him the joke is offensive but if he did genuinely identify as that, that’s fine. This only makes them laugh more. Spencer continues on this, asking me how I could believe something so ridiculous. He argues that race isn’t about choice, it’s about biology, and I concede this. I clarify that I am not talking about race, I’m talking about ethnicity which, although often misused, refers to culture, not necessarily biological heritage. He scoffs. We move on to gender. I tell him I was asking about his gender, not what genitalia he has. To this he says “Wanna find out?” and they all erupt in laughter. I ask him if this has implications for superiority or inferiority of races over each other. He tells me, “When you say ‘superior’ you have to ask in what, and yes, in terms of doing verbal reasoning, yes, Ashkenazi Jews [for those unfamiliar this means Jews originating in Eastern Europe] are superior to Europeans. In terms of mathematical or spatial reasoning, East Asians are superior to Europeans. So yes, you could say that once you get a specific measurement there are differences where you can say one is superior or inferior.” This is a great example of him saying something that could not be described as anything but racist, but doing so articulately which is so much more pernicious. It sounds like it makes sense because it is said intelligently, that is, until you examine what he is really saying. I ask him about what this means for overall superiority or inferiority of races and he tells me, “An African with a strong sense of himself, are they really gonna care that, on average an East Asian is more likely to score higher than he is on an IQ test. Who cares?” I’d like to point out that it seems like he cares. This all raises the question, so what’s your solution? How do you think we should operate the world differently with this information in mind? So I ask and he answers, “Multiracial and multicultural societies are going to have a great deal of distrust and unfortunately a great deal of unhappiness in them. There’s going to be a great deal of conflict that is really inherent to the system.” In other words, we should not live in multiracial, multicultural societies because the races are not meant to cohabitate. Another bystander brings up Hitler. First, he dismisses the question as being historical and therefore irrelevant, he says he’s looking to the future instead. So, I ask, seven times before getting a straight answer, if he condemns the attempt of Adolf Hitler to create a purely “Aryan” country. After saying “I think Hitler is misunderstood” and telling me he does condemn violence, he finally answers whether or not he condemns Hitler, saying, “No, I don’t. The idea that someone would want a country of their own, that someone would want a country that’s defined by their ancestors and their people, I do not condemn that.” He is so skillful at making white supremacy sound like a nice fairy tale that he can almost make Hitler sound like someone who just wanted a quaint little Germany with his extended family – almost. On this note, and after a digression about the likelihood of Trump interning muslims, which Spencer does not think is likely, I ask him, what’s the end game? He gives me the “medium term” and the long term. First, he “want[s] European Americans to have a sense of themselves. I think at this point they, we, don’t. We have a sense of ourselves as individuals, we might even have a negative sense of ourselves.” The long term? 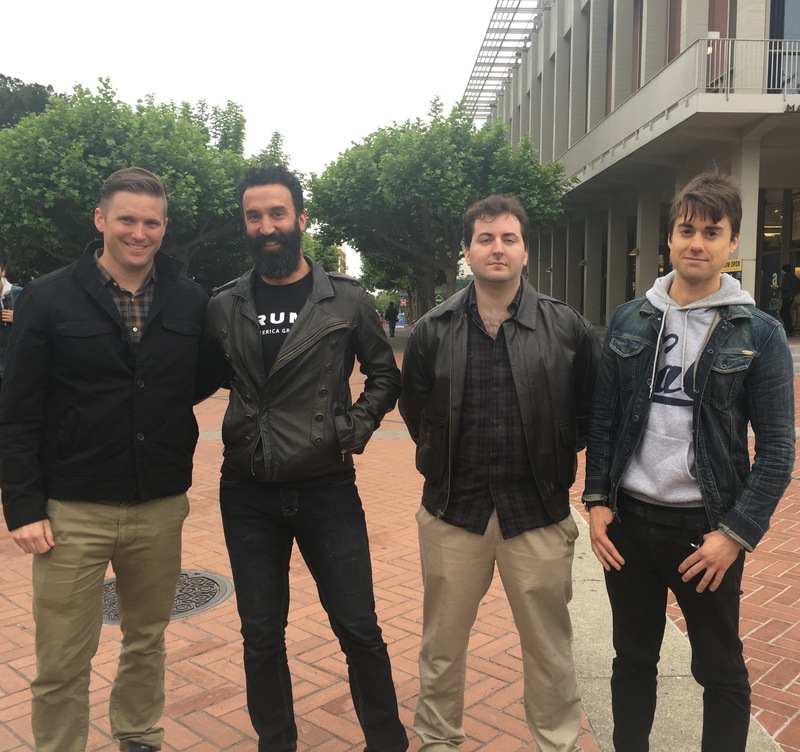 For some final details on these men, they are a part of the group “Identity Evropa” which advocates for white nationalism and European identity. 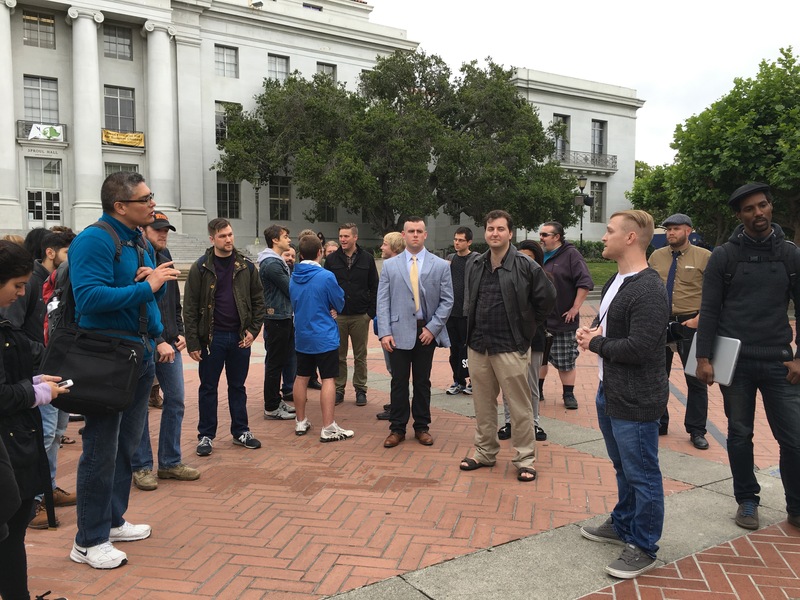 None of these men, and all were men, are UC Berkeley students, one was a Berkeley graduate. All were voting for Donald Trump.